Despite a solid performance from the defense for most of the game, the Aggies pull away from Rebels late in the contest. College Station, Tex. 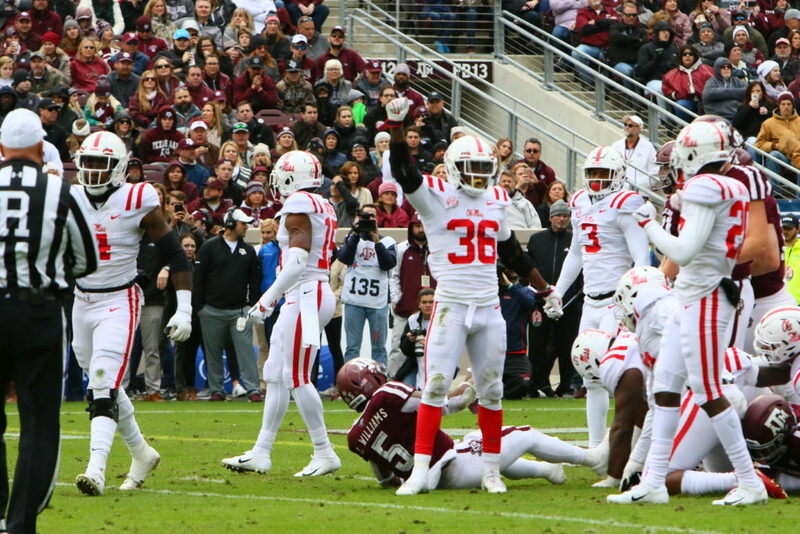 — Against A&M at Kyle Field, Ole Miss endured another 11:00 am kickoff—but unfortunately, the Rebels also endured another heartbreaking loss in a game in which they had a chance to win as late as the fourth quarter. The Aggies eventually pulled away and outlasted the Rebels, 38-24. Let’s face it, this one was tough and will probably haunt a lot of us for a good while. The Rebs refused to give up and, at multiple points in the game, it seemed as if the odds of winning were in Ole Miss’ favor. But in the end, the team’s lack of depth was apparent and A&M was able to take advantage. Ole Miss quarterback Jordan Ta’amu was solid, going 22-35 for 373 yards and one touchdown, while also adding another TD on the ground. Record-breaking day for A.J. Brown: Wide receiver A.J. Brown had a historic day, breaking 1,000 yards receiving for the second straight year and becoming the Rebels’ all-time career leader in receiving yards, surpassing Ole Miss great Shay Hodge. Brown finished the day with 6 catches for 127 yards. Fellow Nasty Wide Out DaMarkus Lodge caught 6 passes for 122 yards and one touchdown. Injuries were a major issue for the Rebels. The one with the most significance, perhaps, was running back Scottie Phillips who went down with an ankle injury very early in the first quarter and did not return. Fortunately, after the game, offensive coordinator Phil Longo said he did not believe Scottie’s injury will keep him out of next week’s matchup with Vandy. The Ole Miss defense played well, keeping the Rebels in the game and even giving them a chance to run away with it. With 7:15 to go in the game, Ole Miss had an opportunity to tie the game at 24 with a 22-yard field goal that ended up sailing wide right. 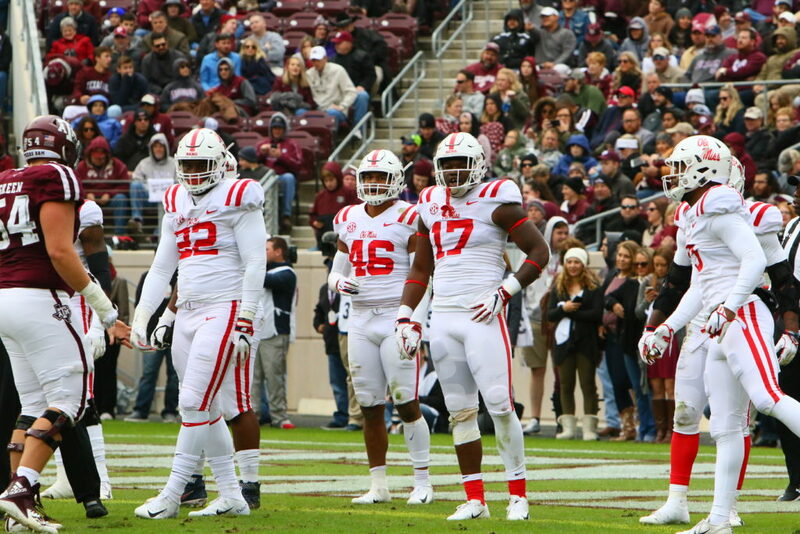 The highlight of the day for defensive coordinator Wesley McGriff’s squad were the back-to-back turnovers the Rebels recovered, including a 96-yard scoop and score by senior Zedrick Woods that gave Ole Miss a 21-14 lead. That was followed by a beautiful interception by Ken Webster. 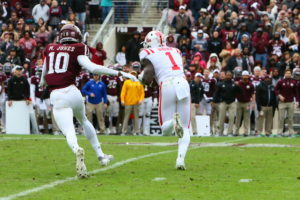 Unfortunately, even with the benefit of back-to-back turnovers, the Rebels’ offense struggled to find the end zone, thus allowing A&M to stay in the game. Ole Miss just couldn’t seem to convert on third down–going a meager 1-for-11 on third-down conversions. The Rebs were manhandled in time of possession as the Ags owned the ball 37 minutes to 22 for Ole Miss. The second half was tough for Longo’s offense as the Rebels only mustered 189 yards. The inability to convert on third down and in the red zone proved too costly. 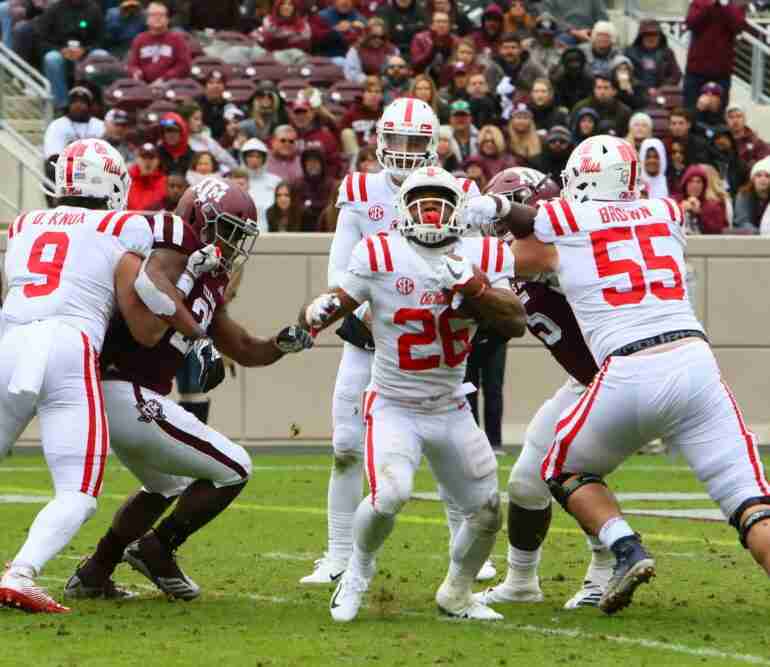 A&M running back Trayveon Williams seemed unstoppable in the second half, en route to a 31-carry, 228-yard day that also including a 46-yard touchdown that put the nail in the Rebels’ coffin. Aggie QB Kellen Mond began to find the soft spots in the Ole Miss secondary which, I believe, played its best game of the year. Mond finished 19 of 28 for 236 yards and 3 touchdowns. He also scored one rushing touchdown. Though this loss is a tough one, the season is far from over. The fact is, this team does NOT quit, and they didn’t quit today. I believe the games against Vanderbilt and State are winnable, but in order to emerge victorious, the defense needs to continue to play like it did for most of the game today, and the offense must find and sustain its rhythm–including getting in the end zone. If both these things happen, Ole Miss could finish the season on a very high note and begin looking forward to the 2019 campaign. Ole Miss travels to Nashville to play Vanderbilt next Saturday at 6:30 p.m. The game will be televised on the SEC Network. Land Teller is sophomore Business major at Ole Miss. The Nashville, Tennessee native is a movie fanatic who is also a rabid Ole Miss, Saints, Titans and Predators fan.